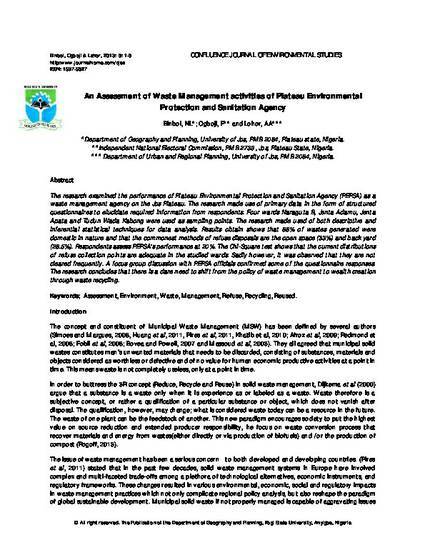 The research examined the performance of Plateau Environmental Protection and Sanitation Agency (PEPSA) as a waste management agency on the Jos Plateau. The research made use of primary data in the form of structured questionnaires to elucidate required information from respondents. Four wards Naraguta B, Jenta Adamu, Jenta Apata and Tudun Wada Kabong were used as sampling points. The research made used of both descriptive and inferential statistical techniques for data analysis. Results obtain shows that 88% of wastes generated were domestic in nature and that the commonest methods of refuse disposals are the open space (33%) and back yard (28.5%). Respondents assess PEPSA’s performance at 20%. The Chi-Square test shows that the current distributions of refuse collection points are adequate in the studied wards. Sadly however, it was observed that they are not cleared frequently. A focus group discussion with PEPSA officials confirmed some of the questionnaire responses. The research concludes that there is a dare need to shift from the policy of waste management to wealth creation through waste recycling.